Kyo Maclear and Isabelle Arsenault’s book is almost a “Wild Things” for girls. A few weeks ago, my daughter and I participated in the Caught in the Act of Reading Challenge at Pragmatic Mom. It’s a really fun way to get kids reading over the summer—though we read so much every day that I couldn’t see us not reading! You just send in a photo of your child reading and you’ll receive a free book. Easy, right? The best part is that Mia, the site owner, will carefully select a book based on the book your child was reading, sending you something that he or she will be sure to like. 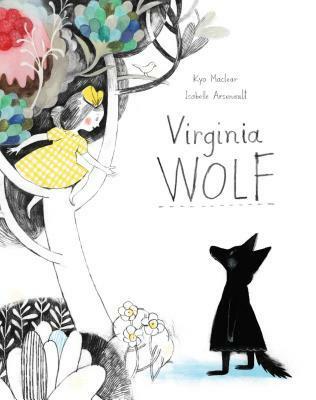 The book we received was Kyo Maclear and Isabelle Arsenault’s Virginia Wolf. The watercolors do remind me of those in the book that we photographed originally, Swimmy—with lots of muted yet beautiful tones coupled with black and white. Once we finished the book, which we both thoroughly enjoyed, I couldn’t help but think of it as a Where the Wild Things are for girls (though the original is for girls, too, certainly! It simply does not feature one), even though the theme of the book was pretty transparent. It’s no coincidence that the title is almost spelled the same way as author Virginia Woolf’s name; the story, which consists of a sunny, yellow-wearing sister attempting to cheer up her wolfish, doldrums-ridden sister, is loosely based upon the relationship of Virginia Woolf herself and her sister. Virginia is wild and grumpy, dreaming of another world in which sadness doesn’t exist—a world called Bloomsberry, in which there are frosted cakes and perfect trees to climb. In order to help cheer her sister up, the sister telling the story paints her a lovely painting of Bloomsberry—which not only makes her sister feel better, but also helps them both see the beauty in things that are imperfect—such as the trees that look like lollipops, or the floppy flowers the sister painted. The round, beautiful imagery, coupled by the story of two sisters—both of whom feel emotions that we have all experienced, and that all children are surely to experience as well—was so enjoyable. Each page features a fine attention to detail, and the rage within Virginia’s doldrums is easy to read aloud, depicted by all-capital text. My daughter wanted to read it again immediately, as she is wont to do with about half of the books we read, and I am thankful that it’s now a part of our permanent collection, since she’s going to want to read it often.